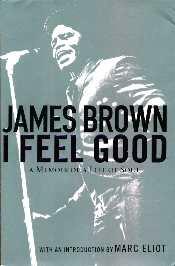 Born in the thirties in South Carolina, James Brown grew up experiencing racial segregation and all its ramifcations. He says he is a good part Apache American Indian (he believes he's descended from Geronimo), Black, and some Chinese. "All you have to do is look at my face - it's all there", he says. Another great quote is, "If those in power back in the late forties and fifties held the lock on the future of America, R & B, soul, country, and rock and roll were the keys that set the next generation free." Brown and his band The Flames, were discovered by none other than Little Richard. Elvis was a friend and someone who borrowed from James Brown, with Brown's blessing. Because he had that soul sound, and Elvis loved gospel music, he often asked about how Brown sang and felt about the music. Brown was a taskmaster and demanded discipline from his band and thought it necessary to retain the respect they'd worked so hard for. The same could be said about his music - nothing was put out until it was as he wanted it - it reflected well on his reputation as a songwriter which in turn showed up in his performances. And, he insists, he's not a rock and roller but an R & B, soul, and funk singer. Brown talks about being on the road and having a family back home and says, "I have been on this planet for a lot of years, and still can't understand how doing what I do and living how I live, it is possible to make a marriage work." Amazingly honest. This is an interesting look at one of the most incredible pioneers in music history. He also tells about his good and bad times, his highs and lows, and lets us in on his private life and into his contributions and struggles trying to help fellow African Americans get further out of poverty and away from prejudice. Lots of well-known artists are mentioned too. The book was a lot mellower than one would imagine. Conclusion - A fascinating read.